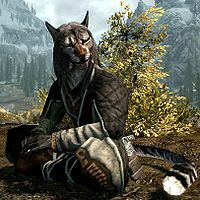 Ri'saad is a Khajiit pawnbroker, accompanied by Atahbah, Khayla and Ma'randru-jo. His caravan is found traveling the roads of Skyrim between Whiterun and Markarth, stopping outside of each and setting up tents for a few days before moving on. He buys and sells every type of item and is a good supplier of ebony ingots, skooma and moon sugar. Ma'dran and Ahkari are other Khajiit traders who work for Ri'saad. Ri'saad wears a set of fine clothes and a pair of fine boots. He is equipped with a steel sword, and carries a selection of upper-class items and gold. When approached, he may greet you, "Welcome. If I cannot serve you, I am sure that one of my other traders can do so." He may also say, "I have traveled far across Tamriel to serve you." or "Perhaps you have encountered Ma'dran or Akhari? Both are sworn to me, and both have worthy goods to offer." If you ask him why he is doing business in Skyrim he will tell you that "An astute question, for we are far from home and this is a cold, hard land. The wise trader finds the best opportunities, even if he must travel far to find them. Skyrim is a ripe opportunity indeed." If you ask him about the impact of the dragons and civil war he will tell you that it is a great opportunity by saying that "The dragons and the war have scared many other traders away, but for those with courage, there is much profit to be made." It becomes clear that he misses his home and he will tell you about his homeland by saying that "The Khajiit hail from a distant land called Elsweyr, bordered on the north by Cyrodiil and the south by the glistening blue waters of the sea. Elsweyr is an arid land of deserts and rocky canyons, where the sun shines warmly, always. There are cities so ancient, the sands have swallowed them whole. But now I will say no more, for I miss my home greatly." When exiting conversations he will politely say "Was there anything else, or is our transaction complete?" During his related quest, Ri'saad will be more cautious when he greets you, "You approach as if you know us, stranger. Who are you and what do you want?" When you tell him you have an offer from the Thieves Guild, he will reply pensively, "Yes, I've heard the Guild is rising back to power. An alliance would be most beneficial to both parties. I'll consider the offer, but I'll have to discuss it with the other caravans." Offering him the satchel of moon sugar will cause him to quickly agree to the alliance, "Ah, Moon Sugar. I could smell it on you. I'm pleased with this offer, and accept. Take my word to the leaders of your guild and tell them we look forward to a prosperous and profitable future." He will then add, "If you happen upon any of our caravans in your travels, we'd also be more than willing to pay you a fair sum for any of your stolen goods." Ri'saad will also provide assistance if you are helping Malborn during his related quest. Ri'saad's caravan will be found camped outside of Windhelm for one day after Malborn arrives in the city, and he can be asked to point out the Thalmor assassin. He will oblige gladly, pointing out J'datharr and will reveal his disgust for his Thalmor affiliations, which he views as giving all Khajiit a bad name. Thieves Guild Caravan Fence Quest: Deliver moon sugar to Ri'saad. This is the merchandise found in Ri'saad's Merchant Chest. These items are only available if purchased from the merchant; they cannot be pickpocketed or stolen. They are restocked every two days. Ri'saad's caravan travels the route between Markarth and Whiterun. The caravan spends two full days camped outside each city before alternating. Ri'saad is mentioned in the book Ghosts in the Storm. This page was last modified on 27 January 2018, at 22:19.